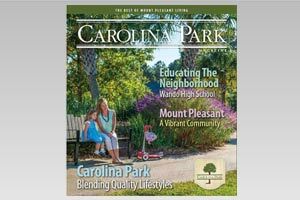 Brought to you by Carolina Homes & Interiors magazine. Include Your Site in this Search! From among all of the golf courses he has designed world-wide, Arnold Palmer is as busy as he ever has been. His current project, The Arnold Palmer Signature Course at RiverTowne, is bringing Palmer's artistry to spectacular heights. In the meantime, Palmer is not letting out many hints. However, excitement at RiverTowne headquarters continues to escalate. Work on the project won't pick up steam for many months, but as the sculpting begins to give form and shape and dimension to the blueprint, the promise of an exquisite property will flower into a beautifully breathtaking design. The course definitely has Palmer's stamp. His personal attention to detail will mold RiverTowne into an outstanding stage, replete with an abundance of protected wildlife, a blue heron sailing majestically over the marshlands, a hawk seeking a mid-day meal, a gator napping in the warm afternoon sun. Vice-president John Gantt is definitely caught up in both the majesty and mystery of the scintillating project. "We're in the early stages of bringing everything together, but with good weather next fall, we should open in the following spring," he says. "When you look at 14 holes that play along the marshes and the beauty of Horlbeck Creek, there is reason to be excited. It's awesome. We also have an abundance of creekside sites and stands of huge oak trees that will play critical roles in the development of this golf course. "The added value here is that there are spectacular views from just about any point on the golf course. Everything is breathtaking," Gantt adds. "In fact, we are having a tough time figuring which hole is going to become our signature hole." So tough the competition in the run for the signature hole, Gantt has toyed with the idea of having members and residents help narrow the field down to that magic moment. The shroud of excitement has escalated as the cornerstones of the project begin falling together. When completed, Palmer will have fashioned a sparkling gem on a property that is as enchanting as the wetlands and majestic oaks that line the fairways using Palmer's deft touch. The 18 spectacular holes that Palmer is knitting together wind through and along the breathtaking marshes that border Horlbeck Creek. From a majestic point of the property, golfers will have an unobstructed, spectacular view of the Mark Clark. Palmer personally oversees his course projects and RiverTowne will join the Palmer course ranks with other spectacular courses that bear his signature worldwide. The golf course measures 7200 yards and features four strong par three holes. All par four holes holes are bulwarks on both the front and back nines. "Arnold has a gem on his hands," says Gantt. "We're deeply excited about everything. There is a lot of energy already, and we keep measuring it daily as it builds for us. UPDATE: Rivertowne Country Club opened in April 2002 set on 550 acres. The 7,244-yard, par 72 layout course features marshes, creeks, and mature forests that give the course and unmistakable Lowcountry feel and look. Visit www.rivertownecountryclub.com for more information. So, what's all this fuss about Arnold Palmer and retirement? It seems that more than one medium is questioning whether Palmer should hang up his spikes along with his bag. Palmer, recall, ruled the PGA Tour until a young, hungry bear cast his long shadow over Palmer, for years the People's choice. Jack Nicklaus, soon afterward to be branded the Golden Bear, was the new kid on the block. The years fly by and Palmer is still flashing that same charismatic smile, hitching up his trousers and thrilling the legions of fans who have followed his heroics for half a century. Palmer, mind you, hasn't uttered an official word about giving up the game. Certainly, his army of fans haven't deserted their man. In his prime, Arnold Palmer was charistmatic, charming, daring and without fear. Even today, he carries those same qualities. 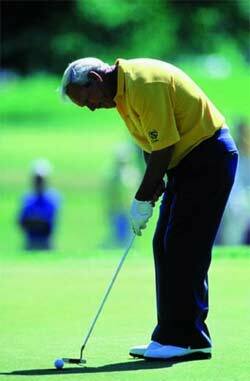 Even though the years are slipping by, Palmer retains the character that made him a legend. His legion of fans still adore him. However, that doesn't address the issue of his eventual retirement. In his 70s, Palmer is still very much in demand and still very revered by fans worldwide. Should he retire? Good question. Not likely at the present. Palmer still draws imense loyalty from his Army. Likely, Palmer could continue to rev up their hearts for another few years. And it appears that Palmer will stick it out for several more selected events. However, some media outlets appear to be hastening Palmer's exit, and in a not-so subtle way. When Palmer arrived at Des Moines for the U.S. Senior Open some months back, the local Des Moines newspaper ran a photo of the Great One on the front page of its newspaper, opening the trunk of his car. Still, every time that Palmer hints that he may pack it in, the mailman staggers to his mailbox with letters begging him to keep playing. As a testimony of his drawing power, the week in Des Moines drew more than a quarter-million fans, fans who gave Palmer and the rest of the field one standing ovation after another. Most of the commotion is speculation and Arnold isn't sharing his thoughts on that subject. One day Palmer may indeed toss his bag in his trunk for good. But, for the moment, the Palmer Era isn't said and done�not by a famous hitch of his trousers. His playing days may be slowly dwindling to a precious few, but Palmer's career is hardly gathering dust. His legend grows, and the legacy of his on-hand golf course design will be living landmarks of green grass, water and sand, and enjoyable weekends by golf buffs up and down the Carolina coast.